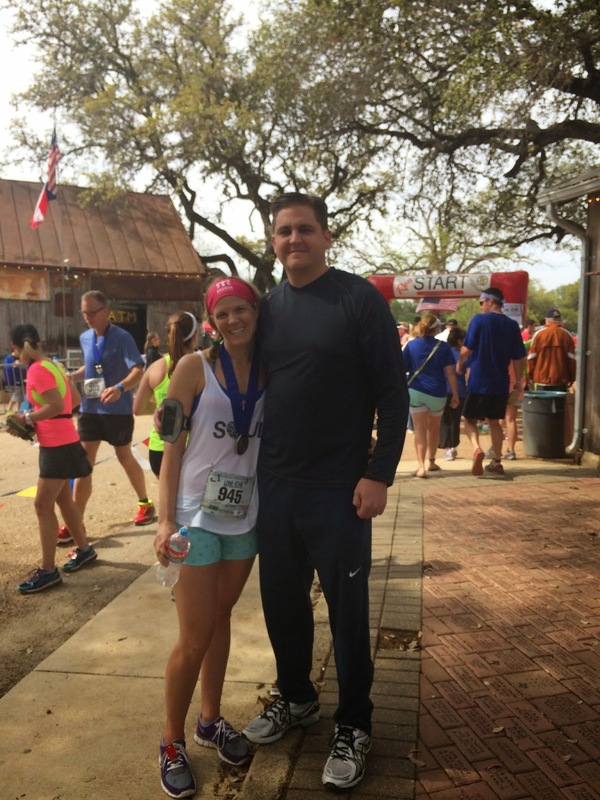 Suzette and I after Lone Star half. Her first ever half-marathon! She did great. We finished in 2:15…only for her to discover she's pregnant!!! which put our running together on hold for a while. Anyway, I bought a book called Hanson's Half Marathon Training Method (or something like that) and got to reading. Before it spells out a specific schedule, it attempts to help the runner understand the "why" for the method and program. Thankfully, I'm someone who has the ability to do more and be more consistent if I get the why. And then I started running. I was running good, feeling good, doing amazing. For about three weeks. Then I was a bit sick. And then it got as hot and humid as a mosquito breeding ground (oh wait, I think it became that too…) Running in the humidity made me feel like a cancer patient. Or at least what I envision them feeling like. So much so that I was worried and googling my symptoms to see what illness had engulfed me. (Think headaches, double vision, and exhausting fatigue.) All my searches pulled up the same answer: humidity. This summer training was killing me and not to mention, I was getting so much slower. That sucked the excitement right out of me and I put my training on hold, trading in the idea of a summer half for one in the fall. So when I was in California mid-August, I started hitting the pavement, slow and steady. My goal was to get a lot of slow, conditioning miles under my belt. When I got back to Texas, I kept going. My long Saturday runs were still fatiguing me but at least I wasn't getting sick. And it was such a natural incentive to stay hydrated and drink tons of water! If I drank water throughout the day of my long runs, I had energy and didn't crash. See, all kinds of lessons embedded in running! My Saturday running group turned into a Monday, Wednesday, Saturday group come mid-September. And can we just say hallelujah. I mean, for real. Up until that point, my 3-4 other runs during the week were done solo and on the treadmill. It wasn't as dreadful as it sounds but I'll tell you what, running with friends vs the treadmill is a night and day difference. Like, I don't even think about the actual running on the days I do it with my girls. And the days I run with them are my "easy run" days and some how now I'm doing 4.5-6.5 miles on my easy days. It's crazy town. And not to mention, it's making me feel more at home in Austin because there's no better or faster way to make friends than running together. About two weeks ago, I pulled the trigger and signed up for the Santa Barabara Half Marathon, which has me racing in 2 1/2 weeks. Come race day, I'll have 13 weeks of training under my belt. In all these months of training (actually starting in April/May when I first developed the goal), I've thought a lot about goals and disappointment. I've never been a goal setter because I look at them as setting myself up for failure. I rarely reach my actual goals so what's the point? A couple insights that have helped me understand myself better and goals better: the goal is the end result. Your starting place is far away from the goal. If my goal is to cook dinner 5 nights a week and I miss after two weeks, I considered that a failure. But the idea is to get in habits where at a point I can somewhat consistently cook dinner 5 nights a week. And even if I don't reach that ideal, that hopefully I'll be further ahead than my starting point. Goals are to move you in a direction. There's a lot of room for successes and failures within the given time period. There are a lot of opportunities to learn from mistakes and get back on the wagon and try again, this time with new knowledge/experience/information. This whole goal thing is starting to click in my hard head a little more these days! So for 11 weeks I've been working to project myself in the direction of running a 1:50:40 half. On November 8th, we'll see how much progress I've made. And although I know I'll be a little disappointed if I don't reach my actual goal, I also know that this time I won't beat myself up either and consider it a failure-- I'll know that I'm on a path!